And what a celebration it was! Starting upon the arrival of Governor and Mrs. George C. Pardee at 8 o?clock the evening of Friday, April 21, 1904, and the lighting of hundreds of electric lights strung through the streets to make the City of Modesto as bright as day, the three-day celebration included speeches, concerts, grand balls, athletic contests and excursions. The entire city was decked out in flags and bunting of green, orange and purple, the jubilee?s official colors. 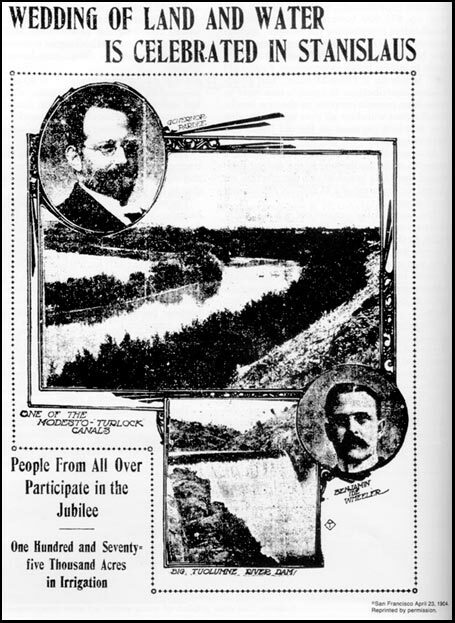 MODESTO, April 22 (1904)- "The wedding of the land and the water," that is the way Lincoln L. Dennett gave terse expression to the keynote of the jubilee in this little city when the formal functions were initiated this afternoon. The Governor emphasized the happy expression when he came to speak officially for California, and tonight several thousand visitors joined with residents of Modesto and Turlock Irrigation Districts in toasting the union and prophesying that it will be a long and prosperous one. When the town retired at midnight last night, heavy clouds threatened, but the morning broke fair and cool, with a sunny sky above and no rain to mar the festivities and set the color running in the tri-color bunting which covers stores and houses ? the orange for citrus products, the purple for the Smyrna figs and the green for the alfalfa crops which come five times a year. The town was never more noisier, never more crowded and never before joyous. By trains, regular and special, automobiles and teams, new delegations to the festival have been pouring in since early morning from many counties. When the special cars from San Francisco arrived with the State Board of Trade and the California Production Committee, the scene of animation reached its height and this first successful large irrigation district realized in a wink how fully its own joy is shared by the great promotive organizations of California? The formal opening of the jubilee was in a sylvan setting. Thousands of men and women filled benches which had been erected on the grass under the monstrous trees in the courthouse park. The Third Artillery Band played for an hour and then Governor Pardee arrived from a drive with his wife and others in the carriage of state festooned with the official festival colors. L. L. Dennett said that this was the celebration of the wedding of the land and water, just as Venice used to celebrate it. Governor Pardee emphasized the truth of Dennett?s words and expressed officially the pleasure of the citizens of California at what has been accomplished in the Modesto-Turlock joint irrigation districts. Then the jubilee was on as per the card. While people crowded forward to shake hands with the Executive, a salute was fired and rockets burst into clouds of color in the sky. Adjutant General Lauck reviewed the battalion of National Guardsmen in camp here, under the command of Major Edward James of Fresno. Company A of Stockton, under Lieutenant F. A. Spencer; Company B of Stockton, under Lieutenant Charles E. Hill; Company H of Merced, under Captain J. R. Graham, and Company D of Modesto, under Captain W. C. Grove, maneuvered in fine order. At 8 o?clock came the grand illumination of the city. Thousands of lights, which were strung today to add to the effect, blazed across streets and over buildings. The grim outline of the big courthouse was marked with yellow lines. On the lawns and at the doors of residences soft Oriental lanterns swung in the breeze. The heavens blazed with the rockets and bombs. This day has been something of a triumph for certain men who have fought the battle for systematic irrigation in Northern California for years. Upon the streets today was C. C. Wright, author of the law under which the Modesto-Turlock district has developed, the first thoroughly successful of its kind. Another visitor was Henry W. Cowell of Manteca, who with the late N. M. Harrold, sunk $400,000 in constructing the Stanislaus irrigation canal in the southeastern part of San Joaquin County, the brinking of the money market leaving both men bankrupt just as the canal was completed. Harrold died in penury and Cowell is just beginning to recoup. His faith has never wavered. Will S. Green of Colusa, the veteran irrigation expert of the Sacramento Valley, is here, prophesying a similar public rejoicing within his own section within five years. Judge J. A. Waymire who, has spent his private fortune to save the Modesto-Turlock district at a critical moment, says he is repaid in results, if not yet in coin. The visitor is met with the facts. He is told how the diverting of water down the south side of the Tuolumne River from La Grange to the Turlock canal has brought salvation to 176,000 acres and how the Modesto canal down the north side of the river has brought new life to 81,183 acres. Land has increased in value from $60 to $70 per acre and productiveness has increased a hundredfold? At the park tonight, T. C. Hocking gave the substantial reason for the jubilee in a neat speech. P. H. Griffin spoke on behalf of Stanislaus County. Governor Pardee delivered an address upon the great work of irrigation which the state has before it and declared that other districts will profit immensely by the example of this one. Will S. Green, Elwood Mead, Ed E. Leake and C. C. Wright also made brief addresses. The evening closed with grand balls in the Armory and Rogers Hall. MODESTO, April 23 (1904) ? That water is wealth was the principle which the visiting participants in the Modesto-Turlock irrigation jubilee had expounded to them yesterday from a rostrum by men who knew, but it was the ocular demonstration furnished the visitors today which captivated their reason and aroused their enthusiasm. By far the most impressive feature of this gay celebration and flow of oratory was the excursion which this morning carried 30 railroad cars filled with visitors from other portions of the state over the twin districts which are divided by the two main canals and their laterals into great rectangles of Eden-like fertility. The very appearance of water-dependent orchards and alfalfa patches, whose crops come only with a flooding miles from any natural stream, was an eloquent tribute to the accomplishments of money, faith and dauntless labor. "It is like a dream fulfilled," said General N. P. Chipman, president of the State Board of Trade. "It is amazing and wonderful," said Ed E. Leake of Woodland. "It is the clean-cut, successful example for the Sacramento Valley to follow," said General Will S. Green, president of the Sacramento Valley Development Association. "It is not new to me," said Judge J. A. Waymire, "for it has been my hope and my gospel for years." Others added for him that it had been so thoroughly his dream that he had cheerfully put it everything he possessed to make the scheme a success. In town the crowds enjoyed the military parade, concerts, fireworks, a review of the troops, an athletic field-day, addressed by distinguished speakers and two grand balls at night; but it was the visit to the cause of all of this rejoicing that won the praise and hearts of all for Stanislaus County and its enterprise. Though the town retired late last night, more people than could be accommodated were on hand when the two special trains prepared to leave the depot this morning at 8:30. The visitors were first carried northward across the Modesto Irrigation District to the San Joaquin line. In the laterals which were crossed, the water had been running for only three months, and yet the first fruits of irrigation are already apparent. Wherever a strip of wheat has been reached, the grain shows a darker green, denoting its superior quantity and quality. Whole farms divided by the check levees into alfalfa patches are already producing the valuable fodder. In a hundred fields, the visitors saw men with scrapers throwing up the low dikes about the land which has borne a crop of wheat for the last time. The fresh paint of new homes glistened everywhere. Ripon and Salida, which have been towns in hardly more than name, are being converted by carpenters and masons into extensive centers. The trains traversed the distance back to Modesto and moved on southward through the Turlock district. Three years of canals and laterals have given this district a great lead. Some of the water-born orchards are already beginning to bear. The alfalfa flourishes from a deep root. Whole tracts of Calimyrna fig trees are shooting out branches. Vegetable gardens and flower gardens surround the comfortable country homes. In the shade of oak, sleek herds of dairy cows chew the cud and dream of pasture aplenty. Two large creameries are to be seen and the visitors learned that the twin districts, which five years ago imported all their butter from San Francisco, passed the million-pound mark with their dairy products export in 1903, while this year?s gain is estimated at 60 percent. Some of the excursionists left the train at Ceres, four miles south of Modesto, for a drive through the tracts given over wholly to figs. Those who went to Turlock with the train saw a town which is having a phenomenal growth and a great area which is coming under a new sort of cultivation through the work of the Swedish Colony. In 1902 the first Swedish family arrived from Iowa. Now 200 Swedish families comprising, 1,100 industrious people till farms of from 20 to 40 acres, which they purchased at $25 an acre and which are now worth twice as much. The citizens of Turlock had decorated the town in honor of the visit. Secretary L. M. Fletcher of the State Board of Trade, who had been placed in charge of the excursion, was escorted to the place of public gathering and crowned with the identical silk hat which Bob Fitzsimmons wore upon arrival in this country from Australia. Secretary Fletcher proudly bore away the tall tile, which had been appropriately draped with the national colors. W. J. Higgins, assistant trainmaster of the division, catered to the wishes of his passengers in halting the trains wherever requested so that points of construction in the laterals and diversion ditches could be studied. The return to Modesto was made in time for lunch, and on the way through town the visitors stopped to watch the water flowing through the model of the La Grange Dam and canals, which gives a fine idea of the big engineering achievement and shows how 1,920 cubic inches of water per second is started out for distribution over the two districts. The military parade drew the throngs to the sidewalk again and a review of the battalion by Governor Pardee followed, before the departure of the executive and his wife for Sacramento on the afternoon train. General Lauck, Colonel Handy, Colonel Weineker, Colonel Whitmore, and other officers in showy uniforms lent dignity to the review. W. H. Hatton presided over the exercises under the trees in the park. A children?s chorus, the splendidly drilled adult chorus of Modesto and a double quartet rendered appropriate songs. Judge Waymire told of the struggle which had been crowned with success at last, and also dwelt upon the importance of the visit of the California promotion committee and the State Board of Trade to the districts at this time. "They will help you in bringing here the people to reap the harvests upon this rejuvenated soil," said the speaker. Colonel John P. Irish told how C. C. Wright, then a young attorney of Modesto, had come to him with his idea of a great system of irrigation and his plan for the law, now known as the Wright irrigation law, by which the formation of successful irrigation districts would become possible. He delineated the long struggle with prejudice and hard times and eulogized its final results. Mayor C. C. Williams of Stockton expressed the pride which the Queen City of the San Joaquin Valley feels in Modesto?s great accomplishment. A re-illumination of the city with the new current from Knights Ferry and another pyrotechnic display ushered in the closing night of the jubilee. F. A. Cressey presided over the exercises at the brilliantly lighted park. General N. O. Chipman spoke on behalf of the State Board of Trade and President Benjamin Ide Wheeler of the University of California made an address in which he prophesied a sometime population of 10,000,000 for the San Joaquin Valley. Other speakers were Dr. Washington Dodge, assessor of San Francisco, Will S. Green, Professor H. Morse Stephens of the University of California and C. C. Wright, father of the Wright irrigation law, who was warmly received. Hamiliton Wright spoke for California promotion committee, and the whole evening was marked with enthusiasm, the visitors having come to share the feelings of the residents to a marked degree. The Third Artillery Band rendered music, supplemented by local singers. Balls at Armory and Plato?s Halls followed. 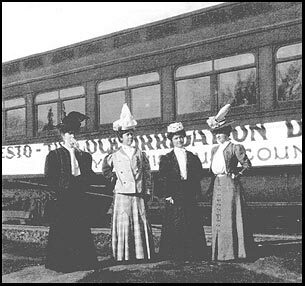 The visitors began leaving this afternoon and early trains tomorrow will convey away all of them who do not remain to join the excursion to the La Grange Dam. With one accord the visitors are expressing in speeches and privately their enthusiasm over irrigation as it is shown here and the gratitude for the magnificent hospitality of Modesto which has made their sojourn an uninterrupted delight. The local committees are more than pleased with the outcome of the jubilee. The logistic problem faced by a community of 2,500 hosting an estimated 5,000 visitors for two days did not dismay the people of Modesto at all. Working through a Modesto Board of Trade committee headed by George McCabe, Modesto found ways to solve all difficulties, building "short order restaurants" on vacant lots, bringing in extra Pullman cars and encouraging home owners to take in guests to ease the burden on overloaded hotels. The electricity for the street lighting display was brought in especially from Knights Ferry. A steam merry-go-round from Stockton was a favorite with the children. Railroads provided round-trip tickets for one-way fares and advertised the jubilee from Bakersfield northward to the Oregon border. Five thousand oranges were purchased at $15 per 1,000 from orchards in Knights Ferry to be given away as samples of the fruits of irrigated land. A working model of La Grange Dam and the upper works of the canal system was built and put on display. The great material benefits which are to come to the tillers of these fields are not, however, the best features of these districts. It is of greater moment that land and water are here united; that the users of the water control it; that the people and the evils and dangers of water monopoly are here impossible. Much has been done in Modesto, and water ? just plain water ? is the foundation stone of it all. Much remains to be done and for years the process of evolution will continue. But the new order of things has come to stay, and in a few years water, nature?s first aid, will have made "old Stanislaus" one of the garden spots of the most favored of all lands, California. 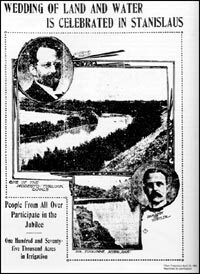 Indeed, as a weary but happy Modesto awoke the morning of Sunday, April 24, 1904, the work was just beginning in that region, which the New York Sunday World in a special California edition had referred to as the "Western Valley of the Nile." But, the primary task of uniting the land and the water had been achieved.